After a Surgical repair by Mr. Williams of your Achilles rupture you will be in a below knee plaster cast splint for 2 weeks to rest the wound and strive for uncomplicated healing. With The cast on you should essentially bare no weight through the foot. Try to rest your foot on its side to avoid direct pressure on the stitches at the back. This video shows how an equinus (Toes pointing) cast can be applied. The wedges are sequentially removed at 1-2 week intervals initially supervised by Mr. Williams or a physio then with confidence by the patient. 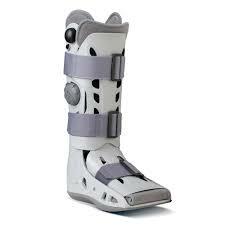 In this Boot you can and should walk fully weight bearing as part of the treatment strategy. You will be advised to remove the boot regularly during the day for specific physio exercises. Once you have been walking with No wedges in the boot you will be guided to wean out of it into a trainer or similar using a small heel lift device about 10mm high. Physiotherapy rehabilitation then begins accelerating as strengthening and gait rebuilding commences.